UCM or Universal Cash Management is a cash handling development interface designed for use by Teller Software Houses. UCM contains the drivers for all the major cash automation devices (i.e., recyclers, dispensers, and coin dispensers) on the market. As new cash automation devices enter the market, we have the solution. UCM is a unique product which offers a Teller Software House with a number of options to meet software development needs. “Interim” Used as an interim measure to meet the needs of your customers. This solution uses Compuflex’s GUI form templates with our proprietary back-end interface that communicates with the cash automation device. "Form Mgmt" Uses Compuflex’s GUI form templates which provides our front-end “look and feel” while simultaneously managing control over the device (e.g. managing error handling). “Hybrid” Uses a combination of GUI form templates from both your organization and Compuflex’s. For example, the “end solution” may consist of your deposit and withdrawal screens and Compuflex’s journal screen. This solution still uses Compuflex’s proprietary back-end interface. 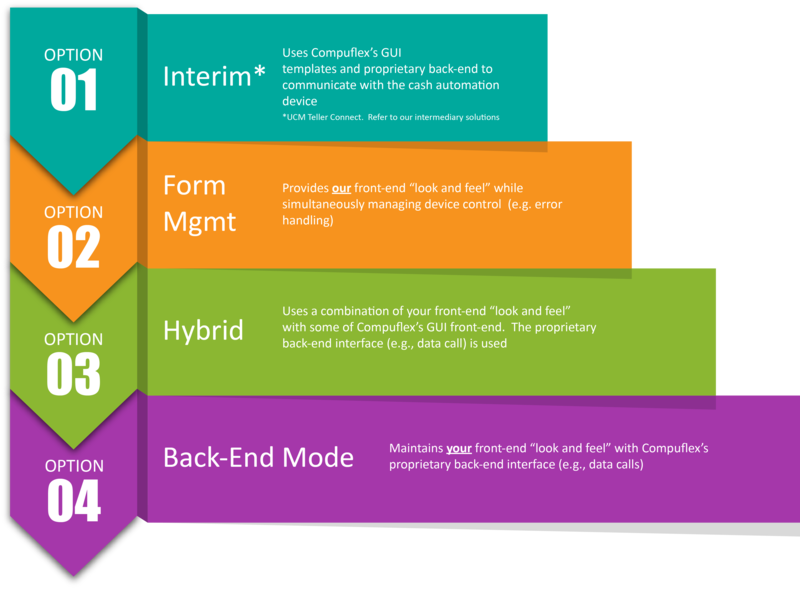 “Back-End Mode” Uses your organization’s GUI form templates with Compuflex’s proprietary back-end interface to communicate with the cash automation device. This solution provides the complete “look and feel” of your Teller Software application.